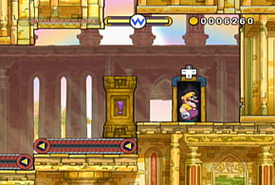 Prism Prison is a secret level in Jiggle Jungle in the game Wario Land: Shake It! It can be accessed if Wario finds the secret map in Riverbloat Rapids. The level takes place in the sky, with clouds being the main platforms. In the background are floating ruins (similar to those of Babylonian ruins) and rainbows against a pink sky. Conveyor belts and spikes are also common here. Rocket Buckets also make a reappearance along with spike rotators. Common enemies include Nosedozers, Pitchforks, and Bandineros. The 'Golden Enemy' found here is a golden Bandinero. Once Wario frees the caged Merfle, he needs to use Rocket Buckets, conveyor belts, and a Max Fastosity Dasherator to escape the prison before time runs out. This page was last edited on January 16, 2019, at 10:51.